The complete designer, the icon of an era, the maker of supermodels—Auggie Cordero has without a doubt, built a solid career in fashion. We can’t get a relaxed, natural smile out of him, even though he is in his home turf. When he senses that the photographer is about to press the shutter release button, he freezes up and his natural smile (he does have one) turns into a smirk. Finally, he musters up the courage to ask if he can smoke, and with that first puff, Auggie Cordero, fashion icon, Pygmalion, casts off all his uneasiness and affectation. In five years, Cordero will be celebrating 50 years in the business. He reigned almighty over the fashion world in decades past, but says he does not miss the frenzy and the lights of celebrity. This may be because he finds himself in a place of contentment, stemming from the confidence of knowing he has taken his craft to heights greater than many of his peers did. And then again, it could also be age. “I am not young anymore,” he candidly says. “But I am comfortable with my life now. I do not want to be a slave and kowtow to anyone.” What’s important to him, however, is to be able to do the things he enjoys doing while surrounded by his most precious possessions: books on fashion, home movies, documentaries (mostly about fashion designers), and an impressive collection of exquisite materials sourced from all over the world. “I get palpitations every time my shipment of cloths arrives,” he says, already getting excited just by the thought of it. 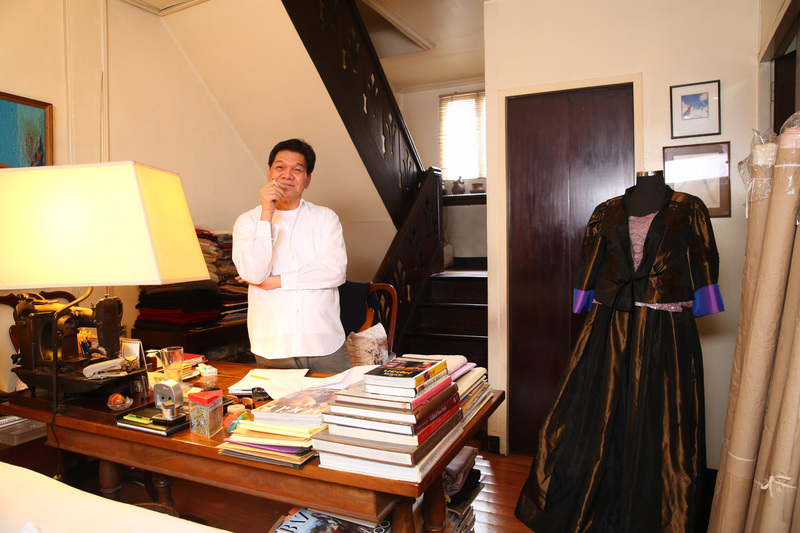 He then tells his trusted staff to individually wrap the fabrics in tissue paper, carefully place them in plastic, and stack them in the many cabinets and storage areas found both in his two-storey atelier as well as his home. They are also catalogued so that Cordero would know where each one is. With great difficulty, he would let go of a special cloth maybe two years later—but not the bronze YSL moire (“that rustled like music to the ears”) he has held in his possession since 1979. “I bought six metres of it in New York for US$120 per metre,” he says, and admits that every now and then, he would take it out of its wrapping, touch it and smell it. He cherishes his alaskin materials, all of 20 colours, bought from a curtain maker way back in 1989. And after the wedding of Jacqueline Bessette to John F. Kennedy Jnr, he bought 20 metres of satin back crepe, the material of the wedding gown. His heart races as well when his shipment of books and magazines arrive from San Francisco. “I buy them online and have them shipped to a friend there who takes charge of shipping me the box once it’s full,” he says, adding that he cannot wait to get his hands on Gods and Kings, the new book on designers Alexander McQueen and John Galliano. As with his fabrics, Cordero catalogues his books and DVDs. Mid-afternoon, Cordero arrived at his atelier slightly flustered. “I had almost forgotten to sleep early so I can be rested for this pictorial,” he told us. “Early” meant that same morning around seven, for the designer is, and has been for many years, an insomniac. Four things keep Cordero up all night. One of them is reading his fashion books, which allows him to keep abreast with international fashion news; he follows the life and career of designers and models and is a walking encyclopaedia on their goings-on. Another is watching fashion documentaries on Google and YouTube, which adds to his encyclopaedic knowledge of the world he moves in. Then, his movies. The previous night, in fact, he was caught up in The Emperor’s Chef, the reason for not sleeping earlier than usual. Lying on his working table is the DVD of My Old Lady, which he will give to a client. It is not an old copy because Cordero will never part with any of his videos. “If I want to share a movie with someone, I buy a new disc,” he says. And last but certainly not the least, dresses. “Every night I cannot sleep because my mind is constantly thinking about clothes. I even dream of them!” he says. “I have wanted to be a fashion designer since I was seven,” says Cordero. This did not please his parents who thought of fashion design as a joke of a profession. “Whenever my mother and my sister saw me sketching, they hit my hand with a ruler,” he smiles in recollection. 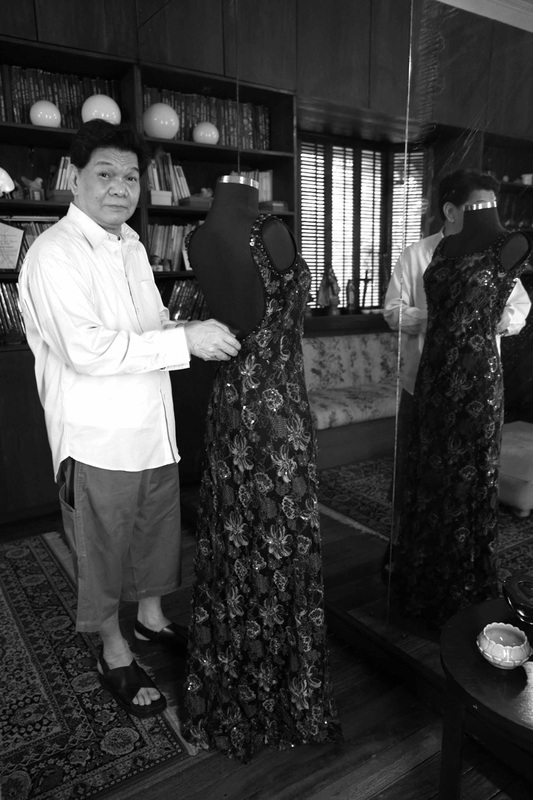 But he persisted, and while in college (he graduated with a Commerce degree from the Far Eastern University), at 19, he apprenticed with a dressmaker who taught him all the aspects of the trade, from fittings to patterns, cutting, and purchasing. Cordero described a totally different era in fashion. “At that time, dressmakers who owned the business did not allow their designers to meet the clients. Only the secretary dealt with the clients,” he says. This basic training, however, gave Cordero his edge in fashion. 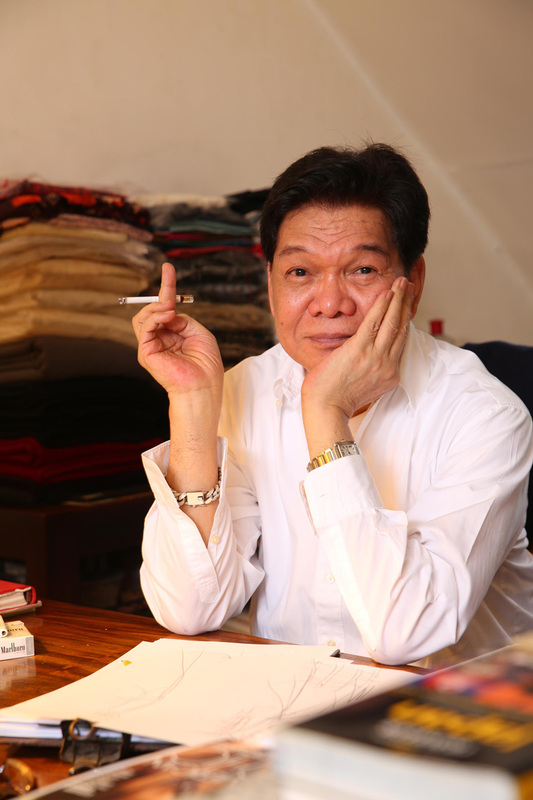 Editor Thelma San Juan calls him the “complete designer” for mastering the many aspects of fashion design. He worked for a few more dressmakers before striking out on his own sometime in the late ’60s, but soon closed shop in 1968 when the protest rallies of the First Quarter Storm threatened his business. “I was scared. My shop was in the school area,” he says. He reopened in 1970, the year he considers the official start of his career. His big break came early, just three years after opening his atelier, the same one he has today, when a client introduced him to Chito Madrigal-Collantes. “Tita Chito was behind the luncheon fashion shows at the Hyatt,” Cordero says. In that milieu he rose fast to the top. Hyatt also gave him the opportunity to do shows in their other hotels abroad. “I was the only Hyatt designer who was doing foreign shows then,” he says, remembering his hit shows in Los Angeles, San Francisco, and New York in the United States, and Singapore and Kuala Lumpur in Asia. He also turned many women into models and many models into supermodels. “Menchu [Menchaca-Soriano], Bessie [Badilla], Gina [Leviste], Wanda [Louwalien],” he names a few. The most famous of Cordero’s models was Anna Bayle, who went on to model for all the top international fashion designers before retiring. By doing what he likes and does best—designing dresses that is—Cordero has lasted long in the trade. There is really nothing else he sees himself doing. “Every time I see the joy on my client’s face as she fits a dress I have just made for her, that is priceless, that is my high!” he says. Then again, he may also entertain the thought of owning a small farm somewhere just outside Metro Manila, build a simple rest house, and plant something—an exercise for relaxation, more than anything else. And oh, yes, continue doing the mental recall of all the cloths in his closet night after night to avert his greatest fear: Alzheimer’s. Cordero need not worry; he has enough materials, as well as memories, as fodder for recollection. Photography by Sara Black | Printed in Philippine Tatler October 2015 issue, available in all leading newsstands and bookstores and downloadable via Magzter, Zinio, and Pressreader.